Today was a very warm and sunny day in Oslo and I hadn't planned to do anything but stay inside and study. However, I ended up having an unexpected day out. My friend was running in a relay race, so I went to take care of her things and give her some water at the end of her run. Since it was quite a spontaneous decision and I hadn't heard much about this race, I thought it might be a minor university event with a few small teams or something. I was so pleasantly surprised when I found out that I was wrong! 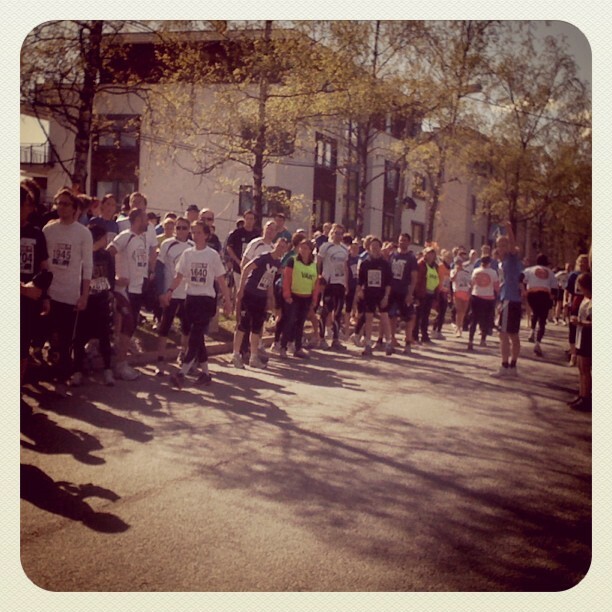 This race was the Holmenkollstafett, an 18km long relay race with 15 members in each team and 40,000 people taking part! It was really fun to watch the people running. Some of them were dressed in a special way, representing their company, university department or charity. We saw a blind man running with the help of a guide, a man in a furry gorilla cosutme and even several young, but very energetic children taking part. There were various mishaps, mainly due to crowd control - it was unbelievable to see the amount of people wandering vaguely in the middle of the street, in the way of all of those exhausted runners! There were also a couple of occasions where the person who was meant to be taking the baton was missing, which resulted me learning a lot of Norwegian swear words! 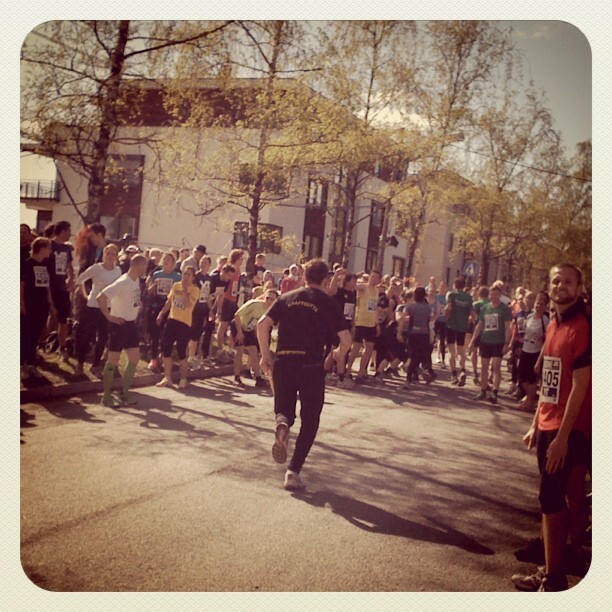 One of the fun parts of the day was hearing the Norwegian crowd cheering at people running past. In England we don't really say anything specific, (do we??) but here they shout something that sounds like "hai-ya, hai-ya"which sounded quite unusual to me. It was nice that even people just passing by stopped to cheer a few random people here and there. The race felt very inclusive and everyone who took part was given a lot of support and encouragement. We stayed for quite a while, watching people whizz past and sunning ourselves happily in the unusually warm weather. It was a really exciting day and it really confirmed for me how much I'd like to take part in a race someday. It must be very rewarding to train for so long and to take part in an event like this, where so many people come out to watch your hard work pay off. Have you ever competed in a race? I hope your Saturday was as beautifully sunny as mine turned out to be! Sounds like a perfect, sunny day. Happy you enjoyed it! It is fun to cheer on runners. I used to be one of them! Looks like a fun day!! i've never done a race b/c I just can't run. Did go up to the park once to watch the runners in Bay to Breakers in San Francisco in the early 90s once and that was fun. Lots of costumed runners. Wow, that's a lot of runners! Sounds like a lot of fun... to witness as a spectator. Lol. I've never taken part in competitions. Like that ecard meme somewhere on the web says: "If you see me running, call the police." Haha! This is just great, I participated in a race last week and I am doing it again this week! The photos are great, you do should participate! And maybe you could dress funny too :D have a nice day!